With the recent publicity surrounding the discovery and sale of the Saddle Ridge hoard of gold coins, I thought it might be fun over the next few months to take a look at a few of the major hoards of U.S. coins that have surfaced over the past 150 years or so. One of my favorite hoards is the famous Economite Treasure, believed concealed in the late 1830s and rediscovered in 1878. Found in the town of Economy, Pennsylvania, the coins had been hidden away by members of the Harmony Society, a communal group headed by George Rapp, who claimed divine guidance. Today, we would certainly regard this group as a cult. The Economy community was modestly successful in the mid 19th century, and played a small role in financing several projects around Western Pennsylvania and Indiana. In any event, in or around 1836, the "Rappites" as they were called, sealed approximately $75,000 in face value of U.S. silver coins in a vault and covered it in brick and mortar. For the next 42 years or so, the coins remained sealed in the dark, damp vault. Then in late 1878, the coins were found, blackened and tarnished from their long storage. After their discovery, most of the rarer pieces were sold to John W. Haseltine, a Philadelphia dealer. He allegedly paid $6,500 for $4,000 in face value, or a modest 62.5% premium over face. The 1794 silver dollar was sold for $22.00. 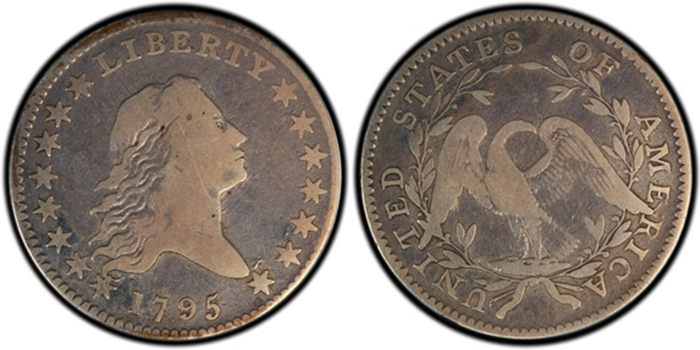 Most of the common pieces, such as the Capped Bust Halves, were paid out to workers and went into circulation. In early 1885, many of the coins Haseltine purchased were auctioned in New York City by the auctioneers Lyman H. Lowe & B. Westermann & Co., where they brought only modest premiums over their face value. Most of the Flowing Hair Halves brought 60¢ each, the Draped Bust Halves between 52¢ and 55¢. The Flowing Hair dollars sold for between $1.20 and $1.30 each while the Bust Dollars averaged only about $1.15 each. As collectors, we are grateful to the members of the Harmony Society for preserving many of the early silver type coins that now lie in our collections. If not for them, most of these coins would have long ago found the melting pot.